June 21 Mario & Rodger Are also joined buy their friends Zack & for a great time catching Some NiceFish!!!! June 21 Mario & Rodger Are also joined buy their friends Zack & for a great time catching Some NiceFish!!!! A nice mess of Trout with Some Big Mackerel and Reds to Boot for a great fishing adventure!!!!! 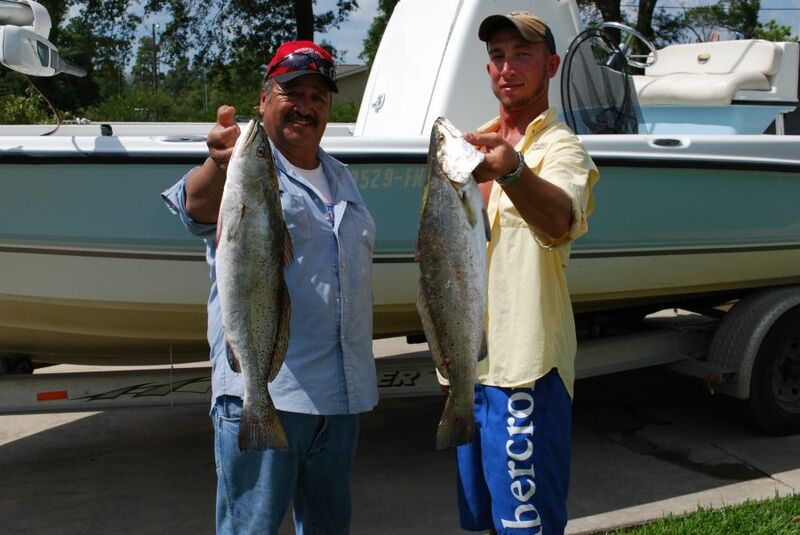 June 20, 2009 Mario G. of Shreveport & Son Rodger Catch 2 Big Lake Beauties 5.7 & 5.3 LBs!!! 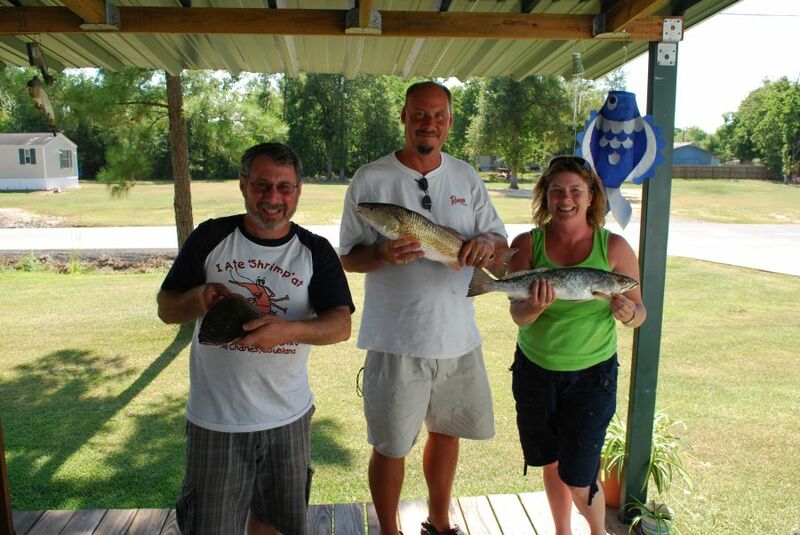 June 20, 2009 Mario G. of Shreveport & Son Rodger Catch 2 Big Lake Beauties 5.7 & 5.3 LBs!!! This was Mario’s 4th trip and Rodger’s 2nd and they landed their 2 biggest Trout Ever on White Berkley Gulp on the same day! Great Job Guys!!!!!! June 19, 2009 Bob L. of Shreveport Brings his Friends For His Second Trip to Lake Calcasieu! June 19, 2009 Bob L. of Shreveport Brings his Friends For His Second Trip to Lake Calcasieu! It was a tough windy day and limited our areas to fish but we still put a few nice ones in the boat on Live Bait! June 18, 2009 Casey K. & Wife Tracey Have A Fun Day with Captain Tom. 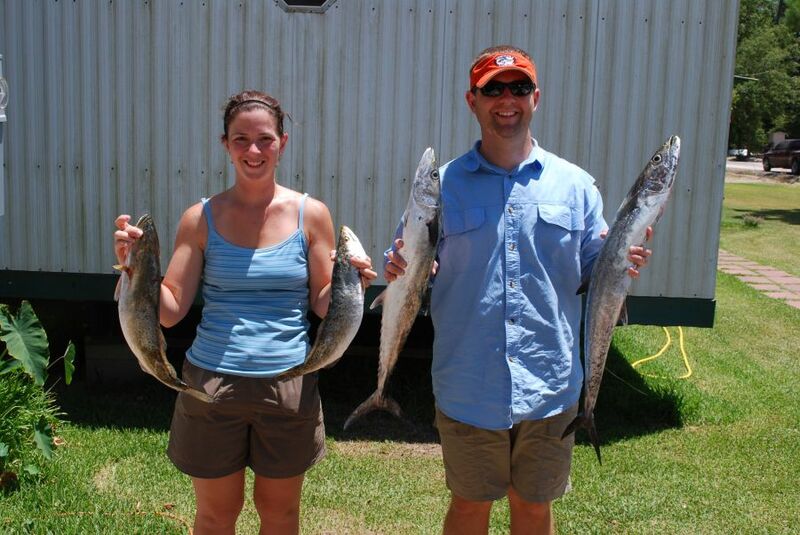 Tracey showed her fishing skills and outfished Casey in both size and numbers! But Casey did win one event – Hardheads boated???? 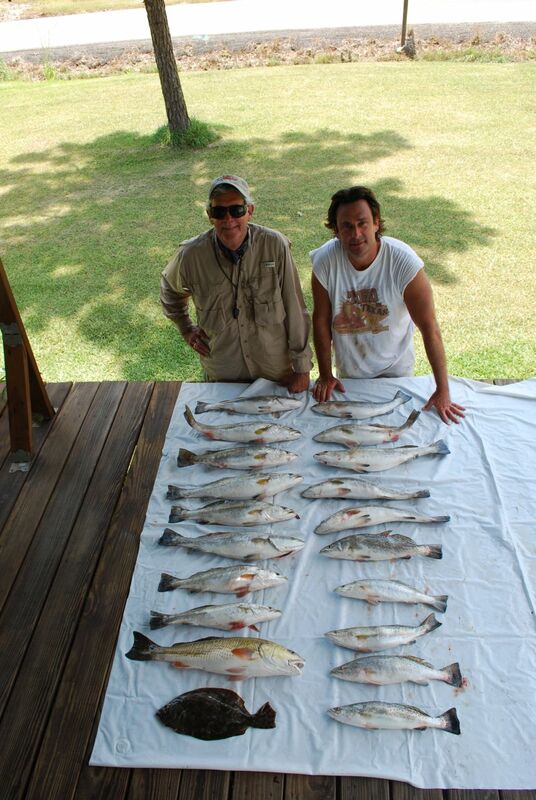 June 17,2009 Ronnie G, Son Randy & Nephew Gary Land Some Nice 2 & 3# Trout. High preasure and windy conditions did not stop these Houston visitors from catching a nice mess of solid Specks on New Penny Berkley Gulp. 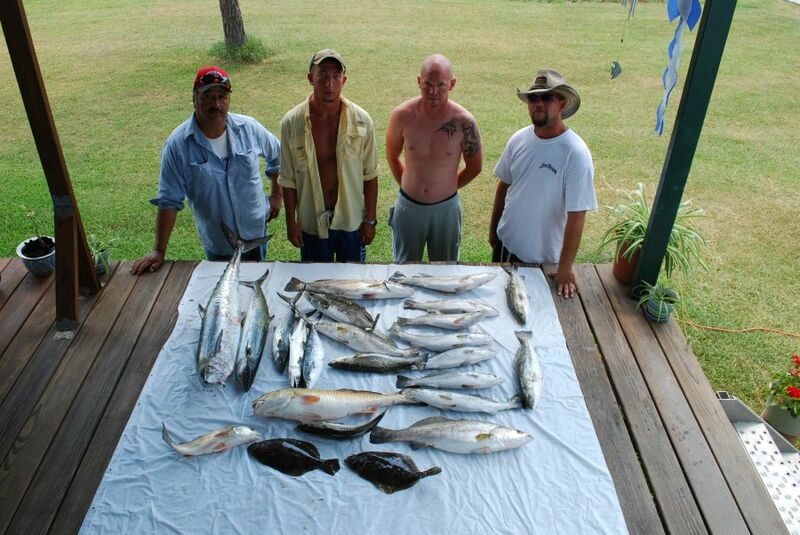 Fishing deeper water and working the bait very slow was the key to their success!!!!!! 6# 2 oz Trout For Captain Tom On 4″ Pearl White Berkley Swimming Mullet!!!!! 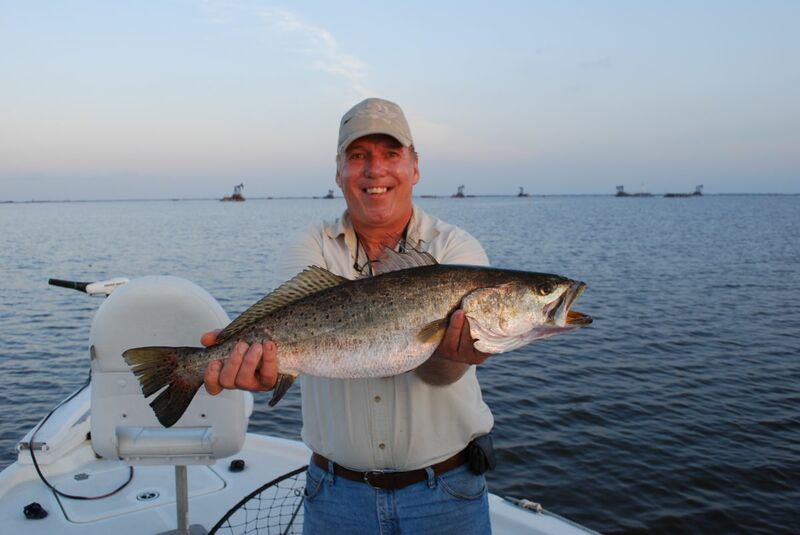 May was a great month for Big Trout on Lake Calcasieu. I was lucky to catch two over 7 #’s and 3 over 6#’s and several 5’s. I’m starting to do more wading and topwater fishing for Big Trout and it’s paying off handsomely!!!! Call me at 318-675-9114 to book a trip and catch a wallhanger of your own!!!!! !